Where fat cells originate, exactly, has been less than clear. Yes, fat cells have their precursors, such as adipogenic stem cells, but these tend to hide in the stromal vascular fraction, a shadowy region where cells of different types are hard to distinguish. To shine a bright light on stromal cells, scientists based at Ecole Polytechnique Fédérale de Lausanne (EPFL) and Eidgenössische Technische Hochschule Zürich (ETHZ) resorted to a technique called single-cell transcriptomics, which allowed them to identify several stromal cell subpopulations, including a subpopulation that inhibits the formation of fat. This reclusive subpopulation consists of cells the EPFL/ETHZ team calls adipogenesis-regulatory cells, or Aregs. These scientists, who found Aregs first in the fat tissue of mice, and then in human fat, hope that they can be harnessed to modulate the plasticity of human adipose tissue. In the long run, this could improve our ability to control obesity and insulin sensitivity and thus to treat metabolic diseases including type 2 diabetes. 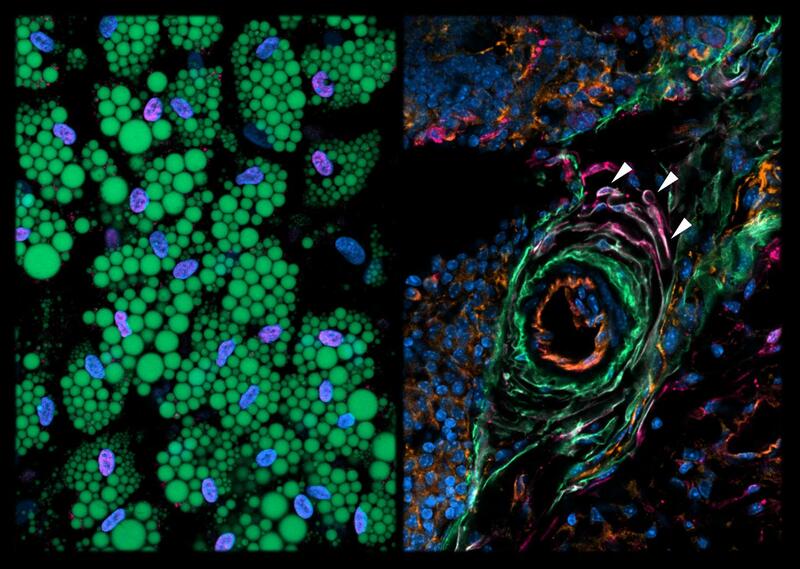 Details of the work appeared June 20 in the journal Nature, in an article entitled “A Stromal Cell Population That Inhibits Adipogenesis in Mammalian Fat Depots.” The article describes how the EPFL/ETHZ team went beyond traditional approaches, such as genetic labeling, to cast stromal cells in sharper relief. Single-cell transcriptomics provides a unique snapshot of which genes are expressed in a cell for thousands of cells at a time. Since cells of the same subpopulation will share similar gene expression profiles, the data obtained can be used to group cells according to their molecular similarity. Using this approach, the scientists first identified several stromal cell subpopulations in the fat tissue of mice. The research team then isolated these subpopulations and studied their cellular behavior. Unexpectedly, they found that one of these subpopulations not only fails to differentiate into adipocytes, it also actively suppresses adipogenesis of other adipocyte precursor cells through a secretory mechanism. These are the cells that the researchers named Aregs. The scientists then followed up by examining human fat, where they discovered the presence of an analogous adipogenesis-suppressing cell population. These findings provide the hope that Aregs, or their mechanism of action, could be harnessed to modulate the plasticity of human adipose tissue. In the long run, this could improve our ability to control obesity and insulin sensitivity and thus to treat metabolic diseases, including type 2 diabetes. Next articleCould Alzheimer’s be Triggered by Herpes Virus?